Virtua Cop 2 (バーチャコップ２) is a light gun Sega Model 2A CRX game, released in 1995 and developed internally at Sega by their AM2 studio. It was ported to home systems on the Sega Saturn in 1996. It was released in PC in 1997 and Sega Dreamcast in 2000. It was later bundled with Virtua Cop in Virtua Cop: Elite Edition for PlayStation 2 in 2002. This game was known as Virtua Squad 2 for the North American PC release. It was succeeded by Virtua Cop 3. Detective Janet Marshall is the new face on the force at the VCPD Special Investigations Unit. Her specialty is subject profiling - the analysis of every detail at a crime scene used to determine patterns of criminal behavior - and she has gained a considerable reputation by putting more than a few nasty criminals behind bars. But last year she lost her partner and mentor, Nick Anderson, while on a case. During the events of the Virtua Cop, the original Virtua Cops, Michael "Rage" Hardy and James "Smarty" Cools, shut down the EVL Inc. criminal empire. Three of the head King and gang leader Boss Kong are all in the maximum security federal pen, and the final member of the EVL gang of four, international terrorist Joe Fang, is believed to have been killed in a helicopter crash, though his body was never found. After the downfall of EVL Inc. a comprehensive investigation of their black market and gun-running activities was launched in the Virtua City bank. The game features three levels through which the player's movement is automated on a predetermined path. It is the player's job to shoot the criminals that appear before time runs out and they shoot back. Along the way there will be various objects in the background that can be broken if shot, some of which will reveal power-ups afterwards. At the end of each level there is a boss battle, as well as one extra final boss battle after all three levels have been finished. Two years later, this cop has grown up with his partner, James Cools, and a newcomer cop, Janet Marshall. He could do better than anyone else, including his part-time job and his duty training. He is known to be a quick draw when things get underfire. Rage is an all-around character in the game. Like his partner, Michael, who worked the same side for the good as well as he does, this doesn't stop him from beating by some bad guys. Although Rage is quicker on the draw in a gunfight, Smarty is known to be the top shot in the police force. A newly-installed special VCPD detective in the Virtua Cop special investigations squad (although the only female cop in the squad), Janet fights for her deceased partner. Note: Sega Saturn Magazine (published in the UK) put up a friendly competition to give Janet Marshall a tag name. The name chosen was Janet "Hubcaps" Marshall. 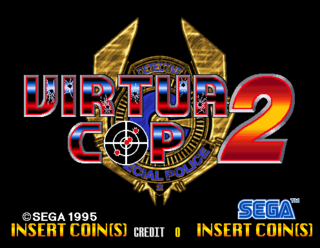 Main article: Virtua Cop 2/Magazine articles. Main article: Virtua Cop 2/Promotional material. README.DOC TXT 7,921 Messages from the developers. SVC2_ABS.TXT TXT (Abstract) 24 About this game. The Dreamcast version of Virtua Cop 2 allows to save game data on the VMU.